Time for a shock to the system! The Monsoon issue of Thinkling is full of amazing tricks, feats of imagination and ability, jesters and showstoppers- lots of high-wire, high-tension, high-drama articles to shake us out of our post-summer stupor. 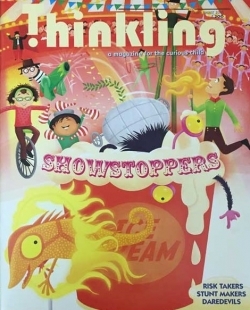 Stand back as you create erupting volcanos and lava cakes, try out gymnastic feats and learn magic tricks. Watch animals step out all feathered-up. There’s a real circus in here!